This morning, there was no way I could pass up the capsicums sitting in the refrigerator screaming for attention. I set out to prepare a pachadi in combination with green chillis to mellow down the sweetness of capsicums. Capsicum and green chilli pieces are sauteed in oil, ground to a coarse paste and slow cooked in a tempering spice base along with tamarind to create an amazingly well balanced flavored pachadi – sweet, sour and spicy. Once you devour it with rice and a dash of ghee, its hard to imagine cooking and relishing capsicums in any other way. Heat two tsps oil in a cooking vessel, add green chillis and fry on medium heat for 4-5 mts, stirring it constantly. Remove from pan and cool. In the same pan, add the capsicum pieces and stir fry on medium heat for 3 mts. Remove and cool. Once cool, grind the sauteed green chillis, capsicum and tamarind paste to a coarse paste. Keep aside. Add the remaining oil to the cooking vessel, add mustard seeds and let them pop, add cumin seeds and dals. Let the dals turn red, add curry leaves and dry red chillis. Add the asafoetida and stir fry for a few seconds. Add the sliced onions and fry for 4 mts or till they turn transparent. Add the ground capsicum-green chilli paste to the sauteed onions and stir fry for atleast 15-18 mts on low to medium flame. Add salt and combine. Ensure that the capsicum-green chilli paste is thoroughly fried in oil. This pachadi stays fresh for a few days if stored in the refrigerator. Serve with hot rice and a dollop of ghee. Something that I haven’t had and something that I definitely am going to try! *Capsicum and green chilli pieces are sauteed in oil, ground to a coarse paste and slow cooked in a tempering spice base along with tamarind*… This sentence itself made my mouth water sailu.. this pachadi is a must must try for me. I love capisicum pachadi. not only this i love almost ur recipes. A quick side dish for rotis. Thanks for sharing. Jeez! That reminds me I have 2 capsciums in my fridge as well 🙂 But now I know what to do with it. Sailu, I just made this with red bell peppers. :-) Thanks for the recipe. I will try it with capsicum the next time. When I saw title pachadi,I thought its made with curds. Looks delicious Sailu and differnt recipe for me. Never heard of this before but does look great. will try it . Delicious! Makes a wonderful side dish for rotis, rice, parathas,dosas etc.. almost everything! I love capsicum but my better half would eat Anything with capsicum in it, so i guess i will make this when i hav esome guests over. Just tried the recipe..It is not only easy and quick to prepare but also tastes awesome. I must say I love your website and the recipes you publish…I always keep watching your site for updates and the new recipes you have published..Thanks a ton for sharing with us your secrets from the kitchen. a nice pachadi, ur dishes are really tastier i would like to ask u for one that is osirikaya avakai. can u help me out for this. This is the first time I am writing to you, your recipes are just amazing. I recently got married and my hubby just loves home made food. Your blog is a boon for me to try out different recipes :-)! Meedhi vizag ani ippude chusa, Okkasariga maa vallantha gurtocharu..I miss that place! I am an ardent fan of your recipes – So far I did not know how to leave a reply. I love capsicums and I will defintely try your pachhadi at once. My daughter is sudakshina and my husband is sridharan – both love and appreciate good food. I give below a simple pickle made of capsicum which is a favorite of my daughter & husband. It goes well with curd rice. The recipe is very simple – heat 3 to 4 tsp. oil in a tawa. Add mustard seed – Let them pop; then add hing; and then capsicum finely cut; and salt immediately so that the color remains green; saute for 15-20 minutes till it becomes soft; then add methi powder; & green chilli and haldi powder; fry for few more minutes – then switch off and add lime juice – This tastes yummy. This was absolutely delicious. Thank you. I tried capsicum pachadi today, it was very very good. As sailu suggested to “stir fry for atleast 15-18 mts on low to medium flame”, this is the method which actually increased the taste of pachadi. I suggest everybody to try this pachadi once. the way u are presenting the food is so simple but tempting to our mouth. keep it up. I had tried your Capsicum Pacchadi recipe some time back. It was delicious! Posted on my blog too. Its taken me 2 years to comment on your website- better late than never!!! Yours was the first food blog that I had come across on googling for some recipe and since then there has been no turning back. Amazing recipes and great talent. Keep it going. This capsicum pachadi turned out wonderful and my Andhra food loving husband surely enjoyed it. Today i made Capcicum pachadi. It came very well. Can u please send me some microwave recepies.i mean general day to day use. Hai Sailu,Today afternoon i prepared ur capsicum pachadi……it is verytasty,Thanks for ur recepie. The pictures are very good. First things first…. Your recipes are awesome and the pictures are mouth watering. I made this pachadi over the weekend and it turned out really well. Question: Can i make this pachadi with Red, Orange or Yellow peppers? Thanks again for all your amazing recipes. This is my first response on your website..eventhough i tried a lot of ur recipes…………u r really excellent..I love the stuff u maintain…..
Today i tried Capsicum pachidi…………oh my god its really really toooo Tasty……………my hubby n me r very happy after eating it….. I tried this recipe today it came out great. Thanks for sharing the recipe. Sailu, I have been a regular visitor to your site for quite sometime. I tried the Capsicum Pachadi yesterday and it was a huge hit. Thanks for sharing the recipe with us. hey…did you know that a site called ‘lazydesis.com’ has the exact photo of you capsicum pachadi? may be recipe too… i did not look too close. they did not acknowledge your site… just wanted to let you know. I was just browsing your website for chutneys and tried this one today. It turned out very good, I cooked with the frozen bell peppers. Thanks for the detailed steps, I also want to try your Peanut Flavored Veggie Fried-Rice, Is there any curry you suggest with it, other than the Peanut Veggie item listed along with it? my husband is from bellary and loves andhra dishes. ever since i am following your blog and making dishes, he s so pleased with all of them and pachadis are always a hit. hope i had found this site early. 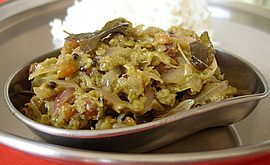 keep posting more andhra recipes and please try out recipes using broccoli, brussell sprouts. want to use as many green veggies in the diet as possible. Love your site and appreciate the time and effort you put into growing and refining it! I love Andhra food, esp the vegetable based pachadis. I tried this recipe and it turned out really well. Looking forward to trying out all the others.